Fort Bragg has identified a female soldier who was stabbed to death Tuesday night. Sergeant Christina E. Smith, 29, was attacked and killed while walking with her husband near their home in north Fayetteville, North Carolina. Smith was a graphics illustrator in Company A, 5th Battalion, 4th Psychological Operations Group (Airborne). Fayetteville police are investigating the attack and have released no new information since Wednesday. Her husband, Sergeant Richard D. Smith, was taken to Cape Fear Valley Medical Center. He has since been released. Christina Smith died on the way to the hospital, police said. She was stabbed more than once. Neighbors said they heard a woman’s screams for help shortly before 9 p.m. and then saw her lying in a pool of blood on Baxter Street near the intersection of Southview Circle. Several passersby stopped to offer help and called 911. No description of the attacker has been released. Smith’s awards and decorations included the Army Achievement Medal, Army Good Conduct Medal, National Defense Service Medal, Global War on Terrorism Service Medal, Korea Defense Service Medal, Noncommissioned Officer Professional Development Course and the Army Service Ribbon. She earned a baccalaureate degree in communications from Xavier University in Cincinnati, Ohio, and she completed the Army’s Warrior Leader Course. She is survived by her husband and her parents, Katherine and Steven Loehrke of Mount Orab, Ohio. The husband of a Fort Bragg, North Carolina, servicewoman and Mount Orab native Sergeant Christina Smith was arrested Friday and charged with her murder along with a second man police say was hired to kill her. Sergeant Richard D. Smith, 26, was charged Friday with first-degree murder and conspiracy to commit murder, said Fayetteville, N.C., police spokeswoman Theresa Chance. The alleged hit man, Private First Class Matthew Kvapil, faces identical charges. Smith is the third female Fort Bragg soldier to be killed in four months and the second from Greater Cincinnati. Specialist Megan Touma, 23, of Cold Spring, was killed in June while seven months pregnant. The father of her unborn child, Sergeant Edgar Patino, 27, has been charged with her death. Also killed was Second Lieutenant Holley Wimunc, 24, who was reported missing July 10. Her body was found three days later. 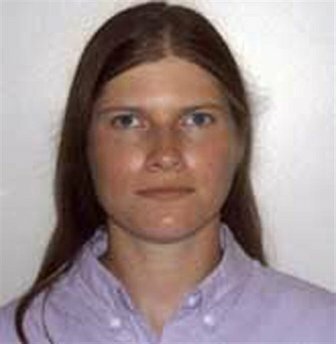 Her estranged husband, Marine Corporal John Wimunc, was arrested in connection with the death July 14, 2008. Smith’s killing shocked the Brown County village where the 29-year-old woman is remembered fondly as dedicated, hard-working and upbeat. She was valedictorian of her 1997 Western Brown High School class. Western Brown High Assistant Principal Dusty Gray walks by a picture of Smith’s picture in the school’s valedictorian hall of fame each school day. “I just knew she was going to amount to something,” said Gray, who coached Smith on the track team. But the promise that Smith offered was taken Tuesday evening when Fayetteville police say she was stabbed to death near her home. Police have not commented on a motive for the killing. Smith, who was known in Mount Orab by her maiden name of Loehrke, graduated from Xavier University in 2000 with a communications degree before joining the Army in 2005, where she rose to the rank of Sergeant. Western Brown District Superintendent Jeff Royalty was band director at the high school when Smith was there. He remembered her as a talented trumpet player and a delightful person. “She was so even keeled. Every day, you sort of knew what to expect,” Royalty said. “She was always cheery and had such a great disposition. Royalty and others in the community said the Loehrkes were active and supportive members of the school community. Through an Army casualty assistance officer, the Loehrke family declined comment. Gray recalled Christina’s father Steven standing proudly at track meets, talking about his daughter’s accomplishments and improvements on the track. “I can see him standing there plain as day,” she said. Gray, who is in her 34th year in the district, said Smith’s death is an extraordinary loss. “We’ve lost kids through car accidents, but to have one murdered, the kind of young lady that she was and what an asset she was going to be to society, it’s just tragic,” she said. Fort Bragg officials said the Smiths were assigned to the 4th Psychological Operations Group of Army Special Operations Command, where Christina Smith was a graphics illustrator and Richard Smith is an electronics maintenance technician. An Army spokeswoman said that Smith’s husband was deployed to Iraq for 10 months from August 2006 through June 2007. FAYETTEVILLE, North Carolina - A Fort Bragg soldier is accused of conspiring with another soldier to kill his wife. Sergeant Richard Smith and Private Matthew Kvapil both face murder and conspiracy to commit murder charges in connection with the stabbing death of Sergeant Christina Smith Tuesday night. All three were assigned to the 4th Psychological Operations Group. "Initially we were told, by now Sergeant Smith, that him and his wife were out on a walk, that he was rushed from behind and he saw his wife being stabbed and the suspect ran," said Fayetteville Police Spokeswoman Theresa Chance. But police say they later learned that Sergeant Richard Smith agreed to pay Private Kvapil $30,000 to kill his wife. Why is still unknown, but for now police describe it as a domestic violence case. Meanwhile, at a creek about four miles from the crime scene off Shaw Mill Road, Fayetteville Police found key pieces of evidence tied to Tuesday night's stabbing death of Sgt. Christina Smith -- including a knife they believe is the murder weapon. Investigators also found the clothes they say Private Kvapil wore the night of the murder. "On behalf of the command and our soldiers, we express our deep condolences to the family and friends of Sgt. Christina Smith. Christina was a member of the Special Operations family and we will miss her," said Lieutenant Colonel John Clearwater with the Special Operations Command. Fort Bragg says disciplinary action against the two soldiers will be taken, but what that entails has not yet been determined. Fayetteville Police said that no more arrests will be made in the case. The two soldiers remain behind bars. They're expected to appear before a Cumberland County judge Monday afternoon. The death of 29-year-old Sergeant Christina E. Smith was the third off-post killing of a Fort Bragg servicewoman in four months, stunning a tight military community that was still seeking to come to grips with the earlier deaths. Sergeant Richard Smith, 26, was charged with first-degree murder and conspiracy to commit murder, Chance said. Private First Class Mathew Kvapil, 18, faces the same charges, and Chance said he was hired by Smith to kill the wife as the couple walked together Tuesday evening. An initial hearing was scheduled for Monday for both soldiers. Officials said they didn't know if either man had been appointed an attorney yet. Christina Smith, who maiden name was Loehrke graduated from Western-Brown High School in 1997, and was the valedictorian of her class. Smith was a graduate of Xavier University and a graduate of the Army's Warrior Leader Course. She was a graphics illustrator in Company A, 5th Battalion, but had been assigned to the 4th Psychological Operations Group (Airborne). A Fort Bragg soldier repeatedly asked an 18-year-old colleague to kill his wife -- also a soldier -- and eventually offered $30,000 for the deed to be carried out, the teen told authorities in police records released Monday. According to a search warrant affidavit, Army Private First Class Matthew Kvapil told investigators he dressed in black and hid in bushes on September 30, 2008, while Sergeant Richard Smith, 26, and his wife, Sergeant Christina Smith, 29, walked near their apartment. When the pair passed his hiding spot, he told investigators, he jumped out and stabbed the woman to death. Christina Smith, of Mount Orab in southwest Ohio, enlisted in September 2005. She, her husband and Kvapil were assigned to the 4th Psychological Operations Group. She is survived by her husband and her parents, Katherine and Steven Loehrke of Mount Orab, the Army said. Both men appeared in court Monday, charged with one count each of first-degree murder and conspiracy to commit murder. Superior Court Judge Tal Baggett scheduled probable cause hearings for October 23, 2008, for both men. Both will also receive court-appointed attorneys. Relatives and friends of the defendants rushed past reporters on their way out, declining through a sheriff's office spokeswoman to comment. The search warrant affidavit entered in court Monday stated that officers responding to an emergency call the night of the slaying found Richard Smith holding his wife, stabbed and bleeding in the roadway near their Fayetteville home. Richard Smith first told police an attacker stabbed his wife in the neck and fled as he chased after him. Officials who interviewed Richard Smith at Cape Fear Valley Medical Center that night mentioned that his voice sounded robotic as he recounted the events that led to his wife's death. He also mentioned having picked up a friend -- Kvapil -- to buy supplies for an upcoming camping trip. In a second interview with authorities, Kvapil said Richard Smith had propositioned him at least twice about killing Christina Smith. Richard Smith said he'd done it before, Kvapil told police, and mentioned how lucrative murder-for-hire could be. Police would not comment on details of the search warrants released Monday and it was not clear whether they took seriously Smith's claims of being paid for other slayings. Richard Smith told authorities he'd mentioned having his wife killed to people several times, but only in fun. Kvapil led authorities to the knife used in the attack, according to the warrant. He had discarded it in a creek several miles from the crime scene. Officials took several items from the Smiths' home on Sunday, the warrant stated, including a computer tower, leather gloves, various personal documents and several "sharp-edged weapons." A spokeswoman for the Army's Special Operations Command said Richard Smith, of Denton, Texas, had returned in June from 10 months in Iraq. Kvapil, of Santee, California, joined the Army in 2007. Christina Smith's death marks the third time in four months that a husband or lover has been charged with murder in the death of a soldier based at Fort Bragg. It follows the slayings of Specialist Megan Touma, 23, and Second Lieutenant Holley Wimunc, 24. It also comes less than a year after Marine Corps Corporal Maria Lauterbach of Vandalia, Ohio, stationed at Camp Lejeune, was found dead. Sergeant Christina E. Smith grew up on a small farm in a one-stoplight town in Ohio, where she played trumpet in band and was at the top of her class. Back home, Smith’s family, friends and former classmates say they are stunned by her death, which, police say, was arranged by her husband. Kati Edwards, 29, said she and Smith were best friends throughout high school, when Smith was known as Christie Loehrke. They played in the high school band. Smith ran track and belonged to the honors society. Smith graduated in 1997 as valedictorian of Western Brown High School in Mount Orab, Ohio. The town is about 40 miles east of Cincinnati. Assistant Principal Tim Cook was a physical education teacher when Smith was in school. He remembers Smith as an easy-going student who made sure things were done correctly. Smith worked at McDonald’s in high school and at a plant nursery in college. Edwards and Smith went off to college together for a stint at Xavier University, a Jesuit Catholic college in Cincinnati. Smith still played in the band. But the two lost touch four or five years ago, when Edwards married and had a child. According to investigators and court documents, Smith was stabbed in the neck as she and her husband, Sgt. Richard David Smith, walked near their home at 751 Ashfield Drive. Richard Smith is accused of arranging his wife’s murder. Private First Class Matthew Wayne Kvapil, an 18-year-old who worked with Christina Smith at Fort Bragg, was hiding in the area and ambushed her. Richard Smith, 26, has admitted the crime to investigators, according to police. He and Kvapil are charged with first-degree murder and conspiracy. Christina Smith and Kvapil worked in the 4th Psychological Operations Group, where they were multimedia graphics illustrators. Friends say Christina Smith’s family is a close-knit bunch. Her father, Steven Loehrke, is treasurer of the Republican Party in Brown County, Ohio, according to party Chairman Paul Hall. Hall said he first met the Loehrkes during 4-H shows, when he and Smith’s father were advisers. Christina Smith and her younger brother, Steven, were active in 4-H growing up. She raised goats, and he raised cows. According to Hall, Smith’s parents were very active in their children’s activities. They helped with 4-H and were band boosters. Christina Smith had a very close relationship with her father, Hall said. Earlier in the summer, Steven Loehrke rode his motorcycle from Ohio to Fayetteville to visit his daughter. Hall spoke to Christina Smith’s father briefly last week, he said. For two decades, the Loehrkes have attended Peace Lutheran Church in Hillsboro, Ohio, about 30 miles northeast of their town. Sue Hillger knew the family through the church. Smith and her brother would sit up front during services, and their parents would sit between the children to keep them on their best behavior. She recalls Christina Smith coming by her house to cut and deliver wood for less fortunate people. Hillger said the Loehrkes invited friends over every year for a July 4th fireworks show on the farm. It was at her childhood home, on July 8, 2006, that Christie Loehrke married Richard Smith in an outdoor ceremony attended by about 40 people, including Hillger. The groom wore his Army uniform. The pastor, Doug Campbell, wore his old military uniform. The bride wore a navy blue dress. And the dog wore a bow tie. Two years later, the same pastor who officiated Smith’s wedding will oversee her funeral. The service is scheduled for 11:30 a.m. Saturday at Peace Lutheran Church. “The people who have known her best over the years are just very, very dismayed by the circumstances,” Campbell said. Army Sergeant Richard David Smith solicited at least two people to kill his wife before she was fatally stabbed outside her home last week, according to a police search warrant affidavit. One of the two, 18-year-old Private First Class Matthew Wayne Kvapil, agreed to kill Sergeant Christina Smith for $30,000, the affidavit says. The other unnamed person came forward after the murder to help police, the document says. On September 30, 2008, Christina Smith was ambushed as she and her husband walked along Baxter Street, around the corner from their home at 751 Ashfield Drive in the Hillendale neighborhood. Three days later, Fayetteville, North Carolina, police charged Kvapil and Richard Smith with first-degree murder and conspiracy. Kvapil worked with Christina Smith as a multimedia graphic illustrator with the 4th Psychological Operations Group; Richard Smith was an electronics maintenance technician for the group. The men appeared before a judge for the first time Monday at the Cumberland County Jail. District Court Judge Tal Baggett told them they could face the death penalty and advised them to exercise their right to remain silent. Baggett appointed lawyers to take their cases. The search warrant affidavit explains much about the case, though it doesn’t address a motive for the killing. Detective Jeff Locklear said in the affidavit that police received a report of a stabbing. When officers arrived, they found Richard Smith holding his wife in the street, where she lay bleeding. She died on the way to Cape Fear Valley Medical Center. According to the affidavit, Richard Smith told the detective that on the evening of the murder, he picked up Kvapil after work at Fort Bragg. The two men shopped for supplies for a camping trip. Richard Smith said Kvapil needed a good knife for the trip, but the store was closed. Smith dropped off Kvapil at his barracks at Fort Bragg and drove home, arriving about 8 p.m., Locklear wrote. Richard Smith and his wife went for a walk shortly after, Locklear said. Smith said a man dressed in black attacked them on Baxter Street. Christina screamed, Smith told Locklear, and he grabbed at the attacker but the man got away. When he turned back to his wife, he said, he saw her lying in the street, bleeding. Locklear said he interviewed Kvapil, who told a similar story of shopping for camping supplies then going back to the barracks because the store was closed. Later, Locklear wrote, someone came forward with information about the murder. When confronted with this information in a second interrogation, Richard Smith changed his story, Locklear wrote. He said he had talked of killing his wife but never was serious, Locklear wrote. He said that he and Kvapil planned to stage a fake mugging to scare Christina. Locklear interviewed Kvapil again, confronting him with what Richard Smith said. “Kvapil stated that Richard told him to stab Christina in the neck and that if she was not dead to cut her throat,” Locklear wrote. According to the affidavit, Kvapil said he waited near the couple’s house, then attacked when they walked by. He said he stabbed Christina in the neck and ran away. Kvapil dropped the knife and other evidence as he ran, Locklear wrote. Locklear said Kvapil helped police by showing where he left these items. Police found a knife believed to be the murder weapon in a creek about 1.5miles away from the crime scene. Investigators searched the Smiths’ home about 1:30 a.m. Sunday, court records say. They collected a computer, a rental contract, knives, movie videos, a photo album, nunchucks, a black glove and other items. Richard Smith and Kvapil are scheduled to appear in court October 23, 2008. Funeral arraigments have been set for a local soldier murdered in North Carolina. Sergeant Christina Smith of Mount Orab, was stabbed to death a week ago while walking home with her husband. and Private First Class Matthew W. Kvapil were arrested by the Fayetteville Police Department in connection to her death. According to police, her husband Sergeant Richard Smith conspired to have Christina killed, offering a man $30,000. The other man involved, 18-year-old, Private First Class Matthew Kvapil, and Smith have been charged with first degree murder and conspiracy to commit murder. The funeral for Sergeant Christina Smith is this Saturday at Peace Lutheran Church in Hillsboro. Visitation begins at 9:30 followed by the service with full military honors. Her cremated remains will then be transported for burial at Arlington National Cemetery in Virginia.